Alison bought me John Peel’s (semi) autobiography The Margrave Of The Marshes for Christmas, which was a superb present as the venerable Mr. Peel was responsible for the formation of a sizeable percentage of my musical tastes. 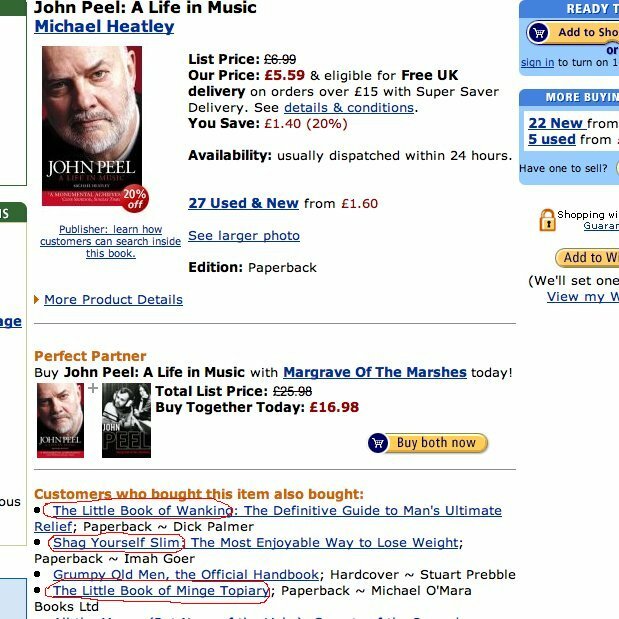 Competing with The Margrave was an unofficial biography, John Peel: A Life In Music by Michael Heatley, which was offered up as one of the “if you like this then you might like this” choices by Amazon.co.uk. I’ve no idea how Amazon’s recommendations system works but obviously the appeal of John Peel, no pun intended, was wider than I thought, including even those solitary souls with an interest in below the belt hairdressing.